With the exception of his two attorneys, Dargan Coggeshall stood in the courtroom completely alone as the decision in North/South Development v Crawford was handed down. The avid Virginia fly angler has been embroiled in a lawsuit for the past two years over the use of the Jackson River, and in particular his ability (and that of the public) to wade in a certain section of the Jackson River. Considered one of the best wild trout fisheries in the east, and the only trout stream in the Old Dominion large enough to float a drift boat, the Jackson River draws visiting anglers from multiple states. Friction between landowners and anglers is nothing new along the Jackson River and started almost immediately with the creation of the Gathright Dam. The dam built in the late 1970’s turned what was once a warm and shallow water bass stream, into a blue ribbon trout fishery with browns occasionally pushing 20 inches. Kayaks, rafters and float tubers are also frequent visitors to the river and local businesses seem eager to draw tourist to the tiny towns of Clifton Forge and the larger town of Covington. Coggeshall’s trouble began in June of 2010 when he was charged with criminal trespassing by North South Development, (www.fishntheedge.com) a small family owned company which sells river front lots. According to the owner of the company Coggeshall was warned multiple times not to return to an area which they had posted as private property between two public access points from Smith Bridge to Indian Draft. Coggeshall who had fished the river for years claimed he had every right to be in the river since the Virginia Department of Game and Inland Fisheries (VDGIF) advertised it as public water. Indeed multiple signs still exists at the public put ins along the river, and on state created maps informing anglers they could fish in the same area where the angler was charged with trespassing. Once Coggeshall was served with a criminal charge of trespassing he contacted the VDGIF and was shocked to find out that while they had been happy to sell him a license, they had no authority to represent him in court. The embattled angler eventually had his day in criminal court and was relieved when the case was nol-prossed due to lingering questions as to river bed ownership. Failing a criminal conviction however, North/South Development refilled civil charges and sued the angler for $10,000. During his ordeal the angler eventually contacted the Virginia Attorney General’s Office as well, but was told since the state was not a party to the case they had no reason to be in court much less represent him. Sportsmen around the state were outraged to discover a license holding angler, who was obeying game laws while fishing in waters the state claimed was public, would not be aided in any way by state authorities. Members of several TU chapters, private citizens as well as companies like Patagonia chipped in funds to mount a legal defense (www.virginiariversdefensefund.org), but this effort proved to be in adequate and in the end and the angler stated lack of funding as a major reason he was abandoning his case. Prior to and during the case the riparian landowner claimed to have a chain of title leading back to a pair of 18th century land grants issued by King George II. Virginia law which asserts state ownership of river bottom, didn’t occur until 1802 long after numerous crown grants had been issued. These grants have led to some landowners claiming the state has over stepped its authority by intentionally sending sportsmen on to private property. VDGIF officials recently disclosed in a white paper written in response to concerns about the case, that state officials presume to own the state’s riverbeds. Uncertainty remains however as to which riverbeds they specifically own in whole or in part due to the expense of investigating such crown grant claims. Crown grant or king’s grant cases as they are often called, rarely lead to litigation in Virginia. Thus named because the land grants were originally deeded from monarchs in Great Britain, king’s grants have become a flash point between landowners and river users across the state. Virginia was one of the original 13 colonies and much of its laws are rooted in English Common Law, especially as it pertains to property. Two previous cases involving anglers on the Jackson River were decided in 1955 and 1996 and in both cases landowners won. Though the state of Virginia claims to have ultimate ownership, these riparian landowners proved prima-facia title, a legal term meaning they “appear on the face” to have superior claim to river bottom than the public. The ultimate decision as to who has actual ownership of the riverbed was left undecided since the state of Virginia refused t to enter the case. Some have speculated that since North/South v Crawford was a civil case, it doesn’t apply to others in the general public. This assumption is incorrect and those that return to this section of the river and touch bottom without prior approval of North/South Development are now subject to criminal prosecution. Some in the sporting community have decided not to return to the Jackson River and all and some fly shops have stopped taking clients there stating the ambiguity of the situation. There is however several miles of river below the dam which are not posted by landowners and these owners have no objection to anglers fishing as long as they stay in the river. Sportsmen across the state have grown more concerned as they’ve discovered the state is unsure as to what its ownership rights are as it pertains to riverbeds. Anglers have also expressed their displeasure at not being certain where they can and can’t fish if VDGIF signs are unreliable. This coupled with the states reluctance to assist anglers who are sued while following all VDGIF rules and regulations have led some sportsman to discuss burning their fishing licenses in a public protest. Anglers are hopeful the state’s legislative body the General Assembly will be willing to provide clarity in this coming session. Thus far however, the only legislator who has shown any leadership on the issue is Delegate Scott Lingamfelter (R) www.va31st.com of Fauquier County. Lingamfelter, head of Virginia’s Sportsmen’s Caucus, is running for Lieutenant Governor in 2013. Lingamfelter has stated he is very concerned with the ambiguity of the situation where state inaction thus far has pitted landowners and sporting citizens against each other. In regards to crown grants Lingamfelter said “I’m ready, willing and eager to bring something about this issue to the legislature.” Though an avid sportsman himself, Lingamfelter is keen on protecting property rights and is known for his balanced approach to tough issues. Anglers in Virginia are still trying to determine how this case may affect other rivers in the state where crown grants are known to exist. Popular rivers like the James, Shenandoah, Cowpasture, Rappahannock, Hazel and York are all subject to crown grants. While anglers are currently barred from touching bottom on this new section of the Jackson River between Smith Bridge and Indian Draft, they can still fish there from a boat since the act of fishing was not before the court. While Coggeshall agreed he would not touch bottom on that section of the river in the future, he was not required to pay damages. 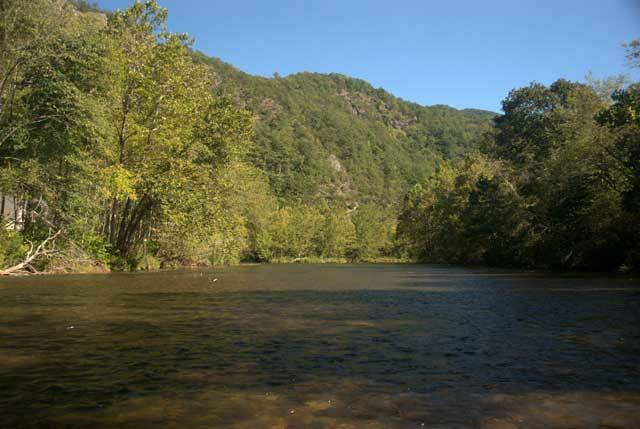 Virginia fly anglers have watched North South Development vs Crawford since the beginning and no doubt some will return to the river while avoiding this section. Others however have sworn not to return to the Jackson River at all, fearing they too may end up standing in court all alone. To see the court’s decision click here. Beau Beasley (www.beaubeasley.com) is an award winning outdoor writer and author of two popular guide books. He broke the original story on the current Jackson River case and is the only journalist to get in-depth interviews with both the angler and the landowner.